Is it the journey or the arrival? The basic synopsis: not everyone needs calculus. Stop making calculus the end goal of the K-12 math sequence. Everyone needs a better grasp of data analysis and digital technology. Teach more statistics and computer science. Teach students the math that they really need. Typically these articles focus on replacing AP Calculus with AP Statistics and/or AP Computer Science or some other programming course. Each article on this topic does note the exception that those interested in STEM fields do actually need Calculus. These articles are typically framed around what everyone else should take – how to offer better (framed as more useful) math for the “I’m not a math person” crowd. Some, most notably Andrew Hacker, go so far as to suggest that the “I’m not a math person” crowd doesn’t even need algebra much less calculus. Instead of investing so much of our academic energy in a subject that blocks further attainment for much of our population, I propose that we start thinking about alternatives. Thus mathematics teachers at every level could create exciting courses in what I call “citizen statistics.” This would not be a backdoor version of algebra, as in the Advanced Placement syllabus. Nor would it focus on equations used by scholars when they write for one another. Instead, it would familiarize students with the kinds of numbers that describe and delineate our personal and public lives. This issue seems to be one of “usefulness.” Calculus isn’t useful for most people. Statistics is useful for most people. Algebra isn’t useful for most people. Programming (or some type of computer course) is useful for most people. It could, for example, teach students how the Consumer Price Index is computed, what is included and how each item in the index is weighted — and include discussion about which items should be included and what weights they should be given. So we should teach how a certain applicable function is influenced by variable inputs but we shouldn’t teach Algebra? Isn’t that the definition of Algebra? How can we jump to the “useful” application without grounding students’ understanding enough for the application to mean anything? I believe what is really happening is that Hacker would rather see “useful” algebra rather than something like, say, factoring trinomials. Nobody (well, almost nobody) factors trinomials for their profession or to get through their daily life. One could make the counter argument that nobody (well, almost nobody) diagrams sentences for their profession or to get through their daily life – but an understanding of grammar and syntax lays a foundation for language development that allows people to craft a blog post (or something more substantial). Perhaps the sentence diagramming argument isn’t really a counter argument but just the same argument Hacker and others are making but applied to English rather than mathematics. Perhaps what is really underlying these articles that are making the argument of teaching more “useful” mathematics is that these articles are less a commentary on the content in the mathematics curriculum and more a commentary on (perceived) pedagogies in the mathematics curriculum. In other words, perhaps the argument is less about what is taught and it is more about how it is taught. Disenchantment with the traditional teaching methods employed have left people looking to jump to the practical applications without journeying through foundations to get there. If you try to convince students that the value in learning to factor trinomials is in its usefulness then it should be no surprise that we see articles like Hacker’s today – eventually those students grow up and realize the farce they endured in math class (actually, they recognized it as a farce instantly but now as adults they are able to make their voices heard more easily). How we teach math certainly matters. I’ve written about that numerous times (see: Cultivating Mathematical Affections). The problem with these articles is that they don’t really address the how question but rather focus on changing the what. Their focus is on altering the end goal and not about altering the methods of the journey. It saddens me that this argument has gained such wide popularity (as seen in the number of these types of articles). Let’s try a different approach and let’s start by defining terms. Notice the term “course” in the definition above. Curriculum, from Latin, literally refers to the act of running or a race track. It is the same concept used in Hebrews 12:1-2 and in 2 Timothy 4:7. It is a reference to being active, to engaging in the struggle of the race, to enduring the distance, to competing. It is not an arrival or a finish line – it is the journey through the race itself. Discussions about the “peak” of the math curriculum miss this. The journey metaphor offers us a different picture of the learner than the passive receptacle. And yet it still leaves the nature and purpose of the journey open for debate. As educational history has walked hand in hand with cultural history, imagery associated with educational journeys has shifted from travel on foot to riding in a coach and then to driving along a highway. In older Christian appropriations of the image, the path was given by God and led (at a more deliberate and deliberative pace) towards God as its destination. In the Enlightenment, the sense of destination remained, but the goal was reframed in terms of movement towards the virtuous life of the useful citizen. As travel became more widely available, the idea of education opening up new horizons took hold. The image of the 19th century explorer offered a version of travel as deliberatively leaving the well-trodden path and collecting new experiences in exotic, uncharted territories. Later still, the rise of mass tourism tilted the image of travel towards comfort, efficiency, and consumption, evoking anxieties concerning educational tourists whose shallow gaze skims the main sights but does not linger for long enough to be changed. The educational path is now giving way to talk of an educaitonal superhighway with a powerful emphasis on speed of information. Alongside these shifts came a gradual yet momentous reversal in which the experience of journeying itself overtook the pursuit of a hallowed destination as the central emphasis; simply being in motion at increasing speed and with increasing range became an end in itself. Eventually, with the fading of a shared destination, any self-chosen destination became equally valid. In contrast to this modern perspective, Smith goes on to discuss the concept of journeying on a pilgrimage in the Biblical narrative, particularly in the Old Testament pilgrimages to the temple. In these arguments over content and methodology, destinations and journeying, the what and the how, I find it refreshing as a Christian math teacher to recall that God is not just the author of the content but also how we come to know it. There is something the journey is meant to do to us – it is not simply meant to be endured until reaching a destination. Is factoring trinomials presented in the classroom as a task to be endured until students can reach the more useful destination of the Consumer Price Index? Or is there a way that we as math teachers can reshape our classroom and reframe our teaching methods so that students experience the value of the journey? I can’t offer a prescription of how to do this in every class so I conclude by simply challenging teachers to consider how their classrooms and their curriculum are focused on getting students to a destination versus equipping students for a transformative journey. 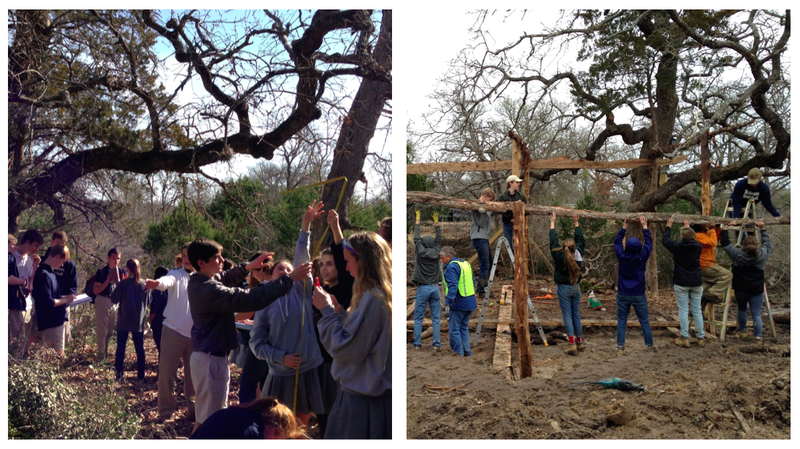 AP Statistics student Vanessa Aguirre shares how their class harnessed the power of surveying, statistics and service to help the Mobile Loaves & Fishes ministry in their efforts to combat homelessness in Austin. On a rainy Tuesday morning, the thirty-six AP Statistics students walked through the Community First! Village of Mobile Loaves and Fishes, a local Austin non-profit focusing on the needs and betterment of the homeless community. 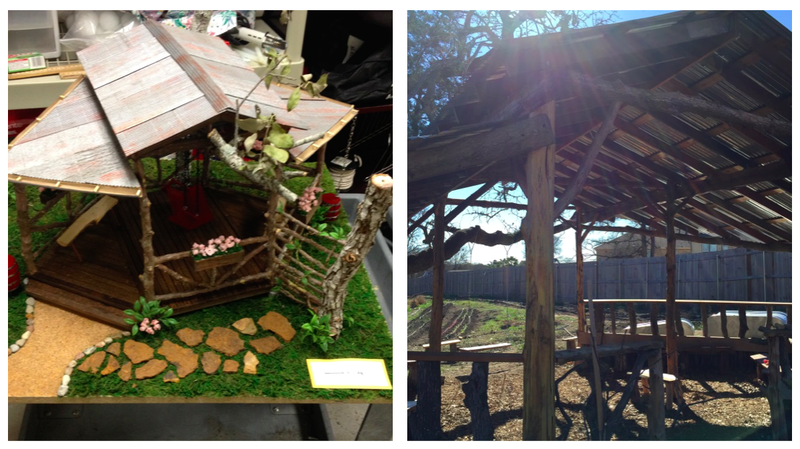 The community village this organization founded is a beautiful, solitary sanctuary, with mini-homes right out of a housekeeping magazine and gardens dotting the landscape. Weaving through the clusters of houses and RVs, the high school students knocked on doors and waited with baited breaths, holding copies of a survey they helped design for the residents of the village. “I was pretty nervous,” senior Lydia Strickland said. Over the course of the morning, the students went from door to door, talking to the residents and sharing their stories, working to fill the survey as their school project that would help Mobile Loaves and Fishes (also known as MLF) in its aim to fight homelessness. The math students worked in tandem with MLF to, ultimately, answer the question: Does a lack of community cause homelessness? 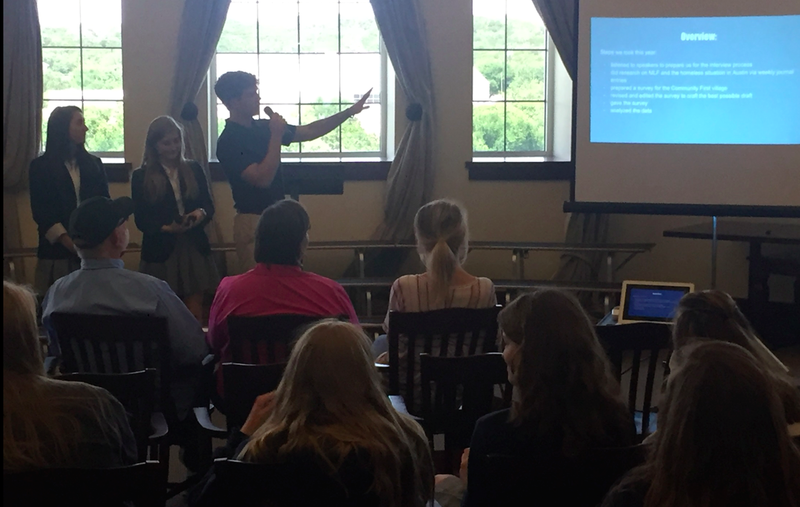 The high school students used ideas and concepts learned throughout the year to edit, carry out, and analyze a survey given to the residents living in the community village the non-profit has made. This question is largely based on Bruce K. Alexander’s “Rat Park” study, where Alexander and other scientists set up a study administering drugs to rats not in isolated cages, but in communities with a positive environment, and found that the drug intake of rats went down dramatically. This shows that environment and community play a significant role in drug use—and leads others to wonder if more than just drug use can be improved. The AP statistics and MLF worked together to explore this train of thought, and to reaffirm MLF’s community-based program. Homelessness is, after all, a very real problem. According to the National Alliance to End Homelessness, there were 564,708 homeless people in the United States in January of 2015, 15% of which were considered chronically homeless. More pragmatically, each homeless person costs taxpayers around $14,480 a year. When you do the math, that amounts to homelessness costing more than eight billion annually. Not only does homelessness affect those directly involved, but it impacts society as well. Efforts to curb homelessness will have a positive impact on everyone. As a large and established homeless outreach ministry based in Austin, Mobile Loaves and Fishes attempts to do just that—curb, and ideally eventually end, homelessness and the factors behind it. 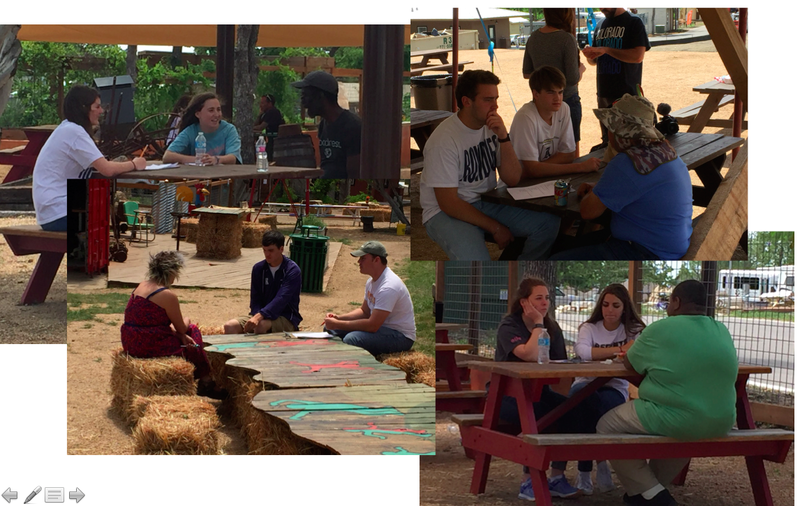 In partnering with the AP Statistics students of Regents School of Austin, MLF hoped to gain more data on the effectiveness of their Community First! Village and the philosophy that poor environment and lack of community are the root problems of homelessness. Not only has the AP Stats project helped as a service, but it’s also helped as learning tool for the students, giving them a deeper appreciation of the concepts they learned in class. This service-learning model is meant to lead students into developing higher-order critical thinking, in a real-world environment, where service to the community (such as alleviating homelessness) is presented as crucial to the course objectives and larger applications of education. Dr. Wilkerson, the Regents AP Statistics and Calculus teacher, sees service-learning as a valuable tool in math education. The project showed that math and making a difference in the world can go hand in hand. In order to help Mobile Loaves and Fishes and its residents, the AP Statistics students at Regents had to learn exploratory data analysis, data collection, probability, and statistical inference. On top of all this, students also got to practice their speaking skills. Students presented the results to representatives from MLF, the culmination of the class’s hard work. The high schoolers also got a better appreciation of how even the little things can affect the world around them. These math students may just be proof that math really can accomplish anything.